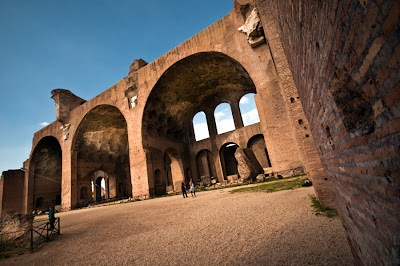 The Basilica of Maxentius and Constantine in the Roman forum: Built close to 2000 years ago this is an engineering marvel. Although I was more impressed with the architecture of ancient Egypt, they did not understand the arch and instead used straight lintels which support smaller spans. The Romans understood the arch and in this building perfected its use with the huge spans you see in this photograph. The original building was three times the size of this remaining section with an unprecedented open floor area because the huge span of the arched/domed construction eliminated the need for the many supporting columns common in the ancient world. Even now we stand in awe of this construction—well at least I do!